First things first, there’s no such thing as perfect. And we know it may pain some of you to hear that, but accepting this is the first step towards achieving your resolution. As you reach for your goals, there will undoubtedly be bumps in the road, but these are completely normal! Often, they’ll provide great learning experiences that make the next part of your journey that much easier. So, don’t throw in the towel just because you ate a slice of pizza one weekend, or dodged a few gym sessions. Treat any mistake as a brief setback rather than a reason to give up, brush yourself off, and get back on track. We’ve all experienced it… the overwhelming feeling of having too many thoughts rushing around our heads, making us unable to concentrate on the task in hand. Similarly, when we set ourselves multiple resolutions, it can be difficult to know which one to focus on, which means that more times than not, we don’t achieve any of them. Just as an unhealthy behaviour takes time to form, so does the new, healthier behaviour we’re trying to replace it with. So, pick one resolution; one behaviour. Then give it all your energy. You’ll feel less daunted, clearer about what steps you must take, and your chances of success will be far higher. When making resolutions, it’s very easy to get carried away. But remember, there’s no shame in starting small. In fact, how many times has somebody told you to “take one step at a time” or “don’t run before you can walk?” There’s a reason these sayings are around; it’s because they work. In other words, try to make resolutions that you think you can keep. For example, if your resolution is to exercise more, start by going to the gym two or three times a week instead of five. If eating more healthily is your aim, try swapping a rich, chocolate desert for something else you enjoy, such as a low-fat yoghurt and fruit. To achieve your resolution, it may help to break it up into a series of steps, each with a sub-goal that is Specific, Measurable, Achievable, Realistic and Time orientated (SMART). For example, if your resolution is lose five stone, you’re not going to achieve this all in one go, so you may break it down into quarterly sub-goals. Instead of having to wait 12 months to see if you’ve achieved your resolution (which can be an awfully long time to keep something going), you’ll have four points in the year to take stock and assess your progress. You’ll then be able to see if what you’re doing is working, or if you need to make some adjustments, which will keep you motivated and on track. Life’s so much easier when we have the support of others, so once you’ve made a resolution, be sure to tell the people around you – the one’s who will cheer you on when the going’s good and pick you back up when you’ve taken a stumble. The added effect of telling people is that once it’s out in the open, it becomes real, and you’re more likely to want to avoid failure. Besides family and friends, there are also other people you can look to for support. 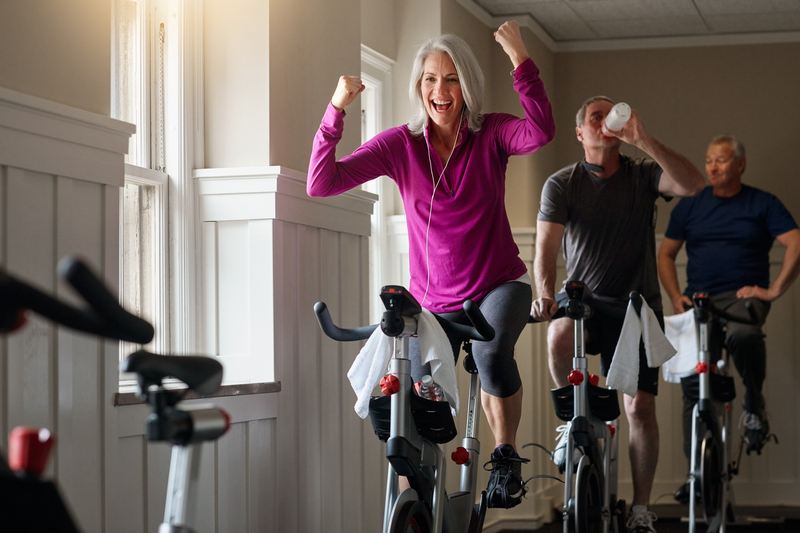 Consider joining a group, for example a workout class at your local 1Life gym or centre or team up with a group of co-workers all with a common aim, such as trying to quit smoking. Groups provide a great opportunity to build friendships and strike up conversations with like-minded people. Being able to share your struggles or successes with others who understand what you’re going through can give you confidence, reassurance and make your road to a healthier lifestyle easier and less lonely. This may sound obvious, but before you stop reading, hear us out… It’s so easy to roll with one of the usual resolutions (because they’re easy and all around us), or to get caught up in the latest trends, especially with the influence of social media. But instead of taking the simple option, think about what you really want out of life, and set resolutions that are personal and unique to you. That way, you’ll be much more inclined to keep them. There are many ways to track your progress, from a handwritten journal or calendar, to a computer spreadsheet, fitness app or wearable device. Whatever method you choose, tracking has many benefits. It allows us to focus on the progress we’re making against our goals, instead of how far we may “feel” from our goals. It also shows us what we’re doing well and where changes need to be made, helping us to understand the next steps we must take and keeping us committed to our plans. As they say, a picture paints a thousand words, so being able to see all the hard work you’ve put in can be extremely motivational. So, the next time you do a workout, be sure to record it. After reading our tips, you’ll probably be thinking one of three things… I’ve got this nailed, I need to make some tweaks, or my resolution needs a complete overhaul! Whichever it is, time is still firmly on your side, and getting it right now, means having a realistic resolution that you will be able to keep throughout the year. If we can offer support in any way, from helping you set a resolution, to breaking it into steps and tracking progress, please do get in touch or find your 1Life centre and call directly.